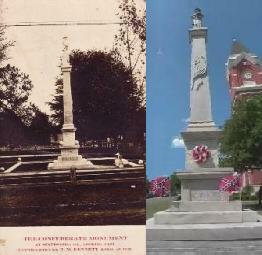 On April 25, 2009, the Ogeechee Rifles Camp # 941 and a number of spectators gathered on the courthouse lawn in Statesboro, Georgia to celebrate the 100th anniversary of the creation of the Confederate Statue on the lawn. The statue was sponsored by the Statesboro Chapter of the United Daughters of the Confederacy and was created by the McNeel Marble Company at a cost between $2,000 and $4,200. The statue was dedicated on April 16, 1909. Speakers at the event included Col. Enoch Giles, Col. R. Lee Moore, Major J.S. Cone and Jacob Rocker. The celebration included a speech by Deke Cox, Commander of the Ogeechee Rifles Camp #941 and a 21-gun salute, as well as the placing of Confederate Battle Flags on the statue. And a wrong to them, and a shame for us. Poem found at the base of the statue.